Thank you to all that have purchased straps and a HUGE thank you for all of the positive comments and encouraging words!! I'd also like to thank all of those who have offered advice and constructive criticism on how to improve the straps. Many of the suggestions will be incorporated in the next batch! If your favorite color is out of stock, please check back! It will be back in stock soon and other colors will follow! If you like quality watches, both new and old, you're at the right place. Here at The Watch Steward we like all watches, but we especially like Seiko watches. In fact, it was a Seiko 6105-8110 (Apocalypse Now) from July 1975 that initiated the creation of the very first Watch Steward strap. With larger watches being the trend of today, and because of our love of Seiko, we've developed a 22mm strap that works perfectly on the 6309s, 6159s, SKXs, SARBs, SRPs, etc. You'll find that Watch Steward straps make these large dive watches comfortable and secure on the wrist. Still focusing on pure wrist hugging comfort, the "Minimalist Series" straps are not meant as a replacement to the "Original Series" straps, but simply as an addition to the lineup! The "Minimalist Series" strap (above left) has a different configuration, in comparison to the "Original Series" strap (above right), that allows for a lighter feel on the wrist. 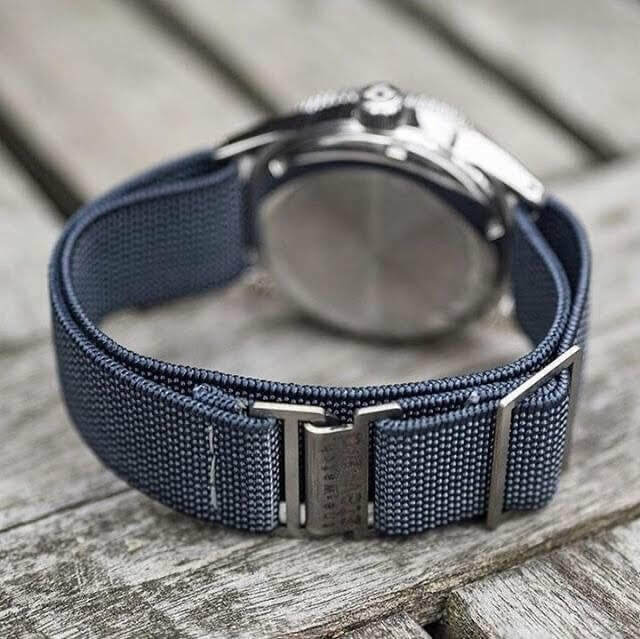 They feature the same custom made 316 stainless steel hardware as all of The Watch Steward Straps!